9th Mile, Ri Bhoi, April 11, 2019: Defense officers from the Director General of Civil Defense Assam held a two-day civil defense training programme at the University of Science & Technology Meghalaya (USTM) on 9th and 10th April where 90 students from the University were imparted training on disaster preparedness, vertical rope rescue, bandages, emergency rescue, drill etc. At the end of the programme on yesterday, Mr R M Singh, IPS, DG, Civil Defense of Assam and Mahbubul Hoque, Chancellor, USTM handed over certificates of appreciation to the students. 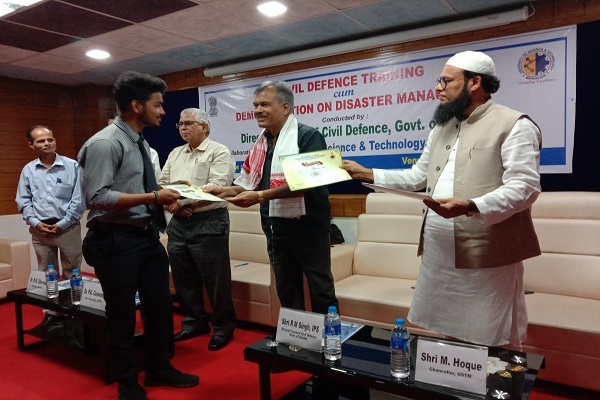 Collaboration has taken place between the Director General of Civil Defense Assam and USTM to train students on civil defense. Addressing the gathering at the valedictory function, Director General RM Singh said that his office is willing to sign a Memorandum of Understanding with USTM so that such training programme on civil defense can be conducted on a regular basis to the students. He also presented videos of civil defense training to the students which would help the students to remember the training for practical use. 16 Civil Defense Officers conducted the two-day training programme at USTM. Speaking on the occasion, Mahbubul Hoque, Chancellor, USTM said that theoretical course is not enough for disaster preparedness. He also stated that USTM and DG Civil Defense will jointly run six-months and one year courses on Civil Defense for students.